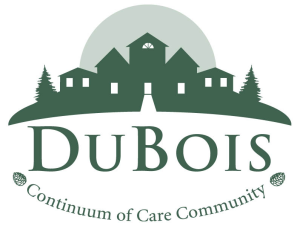 DuBois Continuum of Care Community provides Skilled Nursing Services, Personal Care Services, Residential Living, and Home Care Services to residents of the DuBois, PA community and the surrounding area. SKILLED NURSING SERVICES AT DUBOIS NURSING HOME - DuBois Nursing Home offers professional nursing and short-stay rehab services with a personal touch. Whether you are looking for skilled nursing care, respite services, or dementia care, our professional staff at DuBois Nursing Home will provide your loved one with the compassionate and courteous care they deserve. (814) 375-9100. PERSONAL CARE SERVICES AT DUBOIS VILLAGE - At DuBois Village, you can find the perfect balance of Personal Care and Independence. It is our intention to provide healthcare and a personal interest in your overall well-being and we will do everything we can to make your stay a comfortable, healthy experience. Help is available 24 hours a day to assist residents with the tasks of daily living and residents also have access to an emergency call system, which summons help if needed. With that peace of mind, residents are free to enjoy their retirement years. (814) 375-5483. RESIDENTIAL LIVING AT VILLAGE VIEW - At Village View, our residential living community at DuBois Continuum of Care, we offer an environment of independence with optional services and amenities that are tailored to your specific needs. Enjoy all the amenities of home, without the hassles associated with home maintenance. No more need to worry about lawn care, home repairs, or meal preparation. We do it all for you, so you have more freedom and time to do the things you enjoy. (814) 375-3941. HOME CARE SERVICES WITH DUBOIS HOME CARE - DuBois Home Care helps you maintain maximum independence at home by assisting with daily living. DuBois Home Care offers an environment of security and independence for seniors by providing options for supportive care and client-centered services in the comfort and safety of their own home. (814) 375-3941.